Visitors will find Melbourne an exciting city to explore. Modern architecture and design is juxtaposed with heritage buildings reflecting Australia's cultural history. But beneath the city's impressive façade, lies the true heart and soul of the city; laneways which snake the city grid to reveal cafes and bars, fashion houses, boutiques, innovative cuisine, galleries, theatres and museums. Melbourne, located on the east coast, is the second largest city in Australia. More than 3.5 million people live in the city, which has been voted The World's Most Liveable City on a number of occasions. Melbourne has a lively passion for social eating and drinking, which is reflected in the thousands of restaurants serving up gastronomic experiences from around the world. Everywhere you will uncover a vast array of fashionable cafes, where you can enjoy Melbourne's existential coffee and cafe culture to the fullest. The changeable weather of spring continues in October, a full range of weather may be experienced within a few days, from warm, calm and sunny to cold, windy and showery. Melbourne is a multi-cultural city and a wide range of cuisine is available throughout its many restaurants. Most shops in Melbourne are generally open from 0900 to 1700, Saturday to Wednesday and 0900 to 2100 Thursday to Friday. Major credit cards are widely accepted and tax-free shopping is possible within the city. Walking is the best way to shop, especially along Melbourne's arcades and laneways. 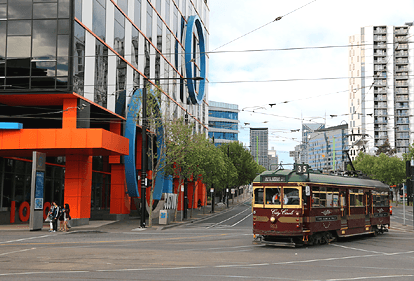 Outside the city centre, visit shopping precincts like Chapel Street in South Yarra, Acland Street in St Kilda and Brunswick Street in Fitzroy, especially on weekends. Here you'll find everything from retro home wares to funky shops selling cult-in-the-making jewellery. These strips also have many street cafes. Travelling between Melbourne's suburbs is best done by tram.